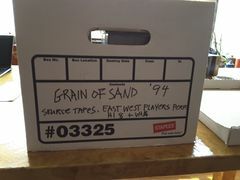 A Grain of Sand is the title of the music album by Chris Iijima, Nobuko Miyamoto, and Charlie Chin. It is widely regarded as the first Asian American music album. The album was recorded and released in 1973 as a vinyl LP by Paredon Records (a revolutionary recording label founded by Barbara Danes). Smithsonian Folkways bought Paredon and released a CD version of the album in 2004, ensuring that the album will be continually available to the public. This page was last modified on 10 March 2018, at 09:20.